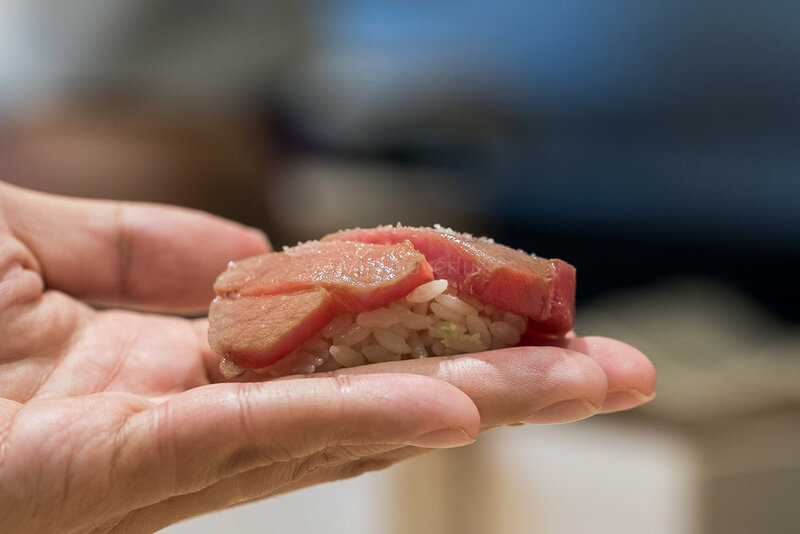 You may or may not have heard about Kioicho Mitani, but it is no stranger to lovers of fine sushi in Yotsuya — a sushiya that is almost impossible to get in, all the time. If you are lucky enough, you may get a seat two years later. Reservations for Mitani Yotsuya are mostly made two years in advance and calls are only answered from 10am on the first working day after Japanese New Year (Jan.1st). And, don't be surprised, all the eight seats are usually taken within a few minutes. Mitani Yotsuya has been on my list for a very long while. In early 2016, when I was still an exchange student at Keio University in Tokyo, I called the restaurant for a reservation. I got through at 9am just before my class began, but was told to call back an hour later. It was only at noon when I was able to reach Mitani Yotsuya again after my class ended. To my dismay, I was told that the sushiya has been fully booked, for the entire year of 2018. In July 2016, Mitani opened a new branch in Kioicho, called Kioicho Mitani. 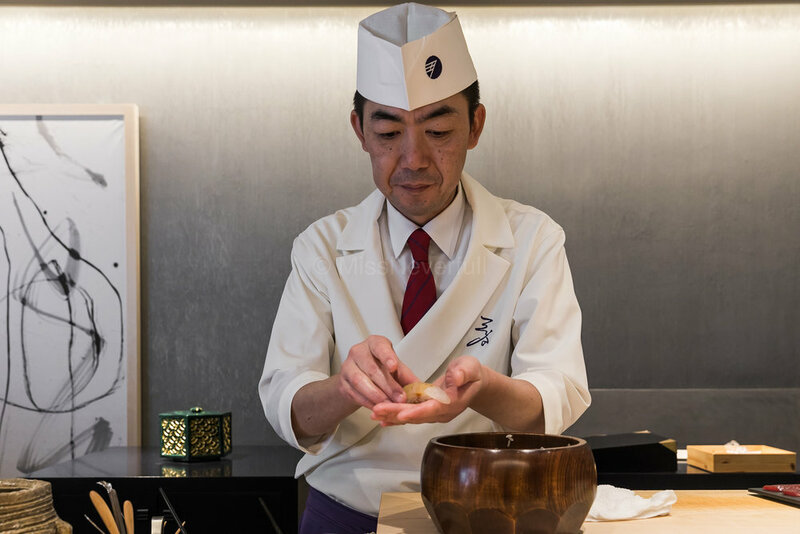 Unlike most sushiya chains whereby the star master chef only serves up his masterpieces personally at the flagship restaurant, the master chef of Mitani, Yasuhiko Mitsuya, makes an effort to delight his guests in person at both of his sushiyas. I visited Kioicho Mitani for the first time in early December in 2016, less than five months after its doors opened. At that time, master chef Yasuhiko Mitsuya was unwell for a long while. We even heard from his sous chef that he was too ill to work every day during that period. Thus, I didn’t get to try his sushi, even till today. Anyway, I wish Mitsuya-san to stay healthy to a ripe old age, more importantly, to feed foodies like me. That said, I still hope for Mitsuya to come back soon/more often to his sushiyas, to create his delectable sushi for as long as possible. Well wishes aside, I was still very excited to try his fellow chefs’ creations after a challenging yet fruitful attempt in snapping up a few seats at Kioicho Mitani. Intimate and cosy yet spacious and brightly-lit, the new Kioicho branch was very well-decorated. And of course, it smells of delicious sushi as most sushiyas do. It was lunch time when two friends of my friends and I visited. The entire counter, with about twelve seats in total, was filled up shortly after we were seated. An Omakase menu, the same menu featured for both lunch and dinner was priced at about 30K JPY per head. The meal started with seven ostumami - all marvellous, probably the most memorable otsumami I have ever had besides Saito's. 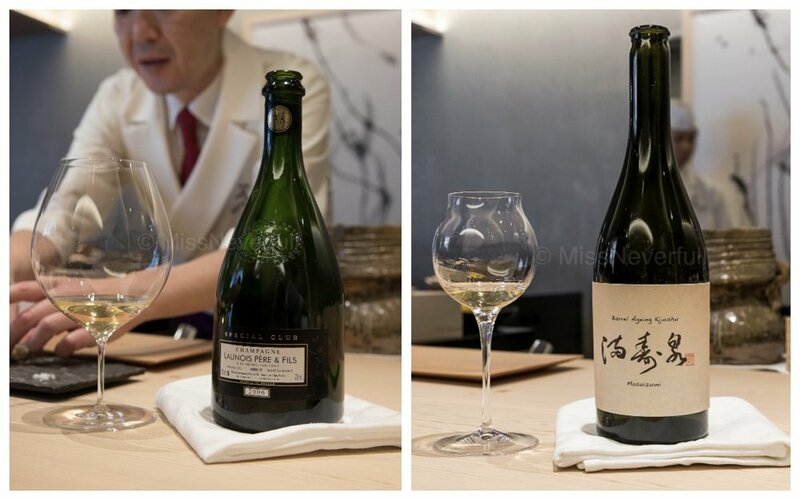 While Saito's are more simple, and edomae-style, Mitani's are less traditional, with a modern touch. Moreover, each otsumami dish was specially paired with a glass of wine. 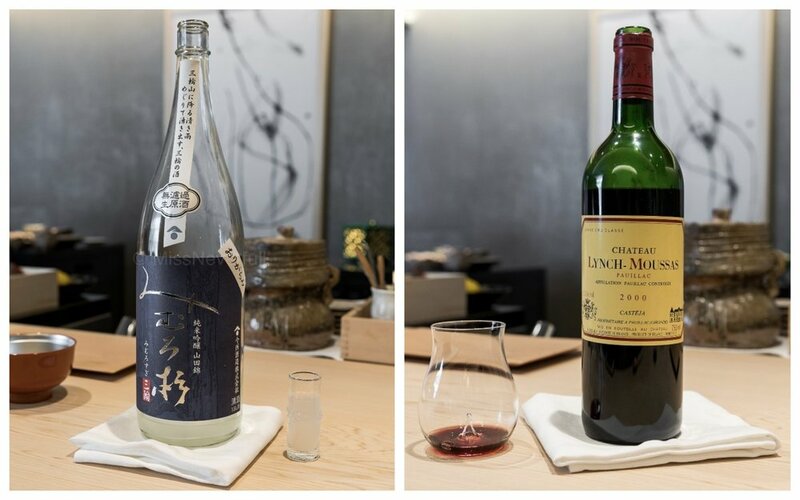 I highly recommend you to try the wines as Mitani is famous for wine pairing, a rare find in a sushiya. Although I am not big on alcohol, I gave it a shot. The first dish was bites of Bafun Uni with a refreshing umami taste of its home – Hokkaido. It was followed by a gorgeously creamy Tara Shirako paste, cooked in an aromatic Anago (sea eel) dashi broth. This was definitely one of the highlights of the meal. Served with a pinch of salt (that hails from Kyushu) on the side, the entire dish was nothing short of AMAZING. This was arguably one of the best Shirako dish I have ever had; so divine and unforgettable. Besides Uni, Kegani, or Japanese hairy crab, is another delicacy that never fails to delight me and Mitani brought out the natural sweetness of crab in its simplest form. Next up, we got a taste of a two-meters long Tachiuo. 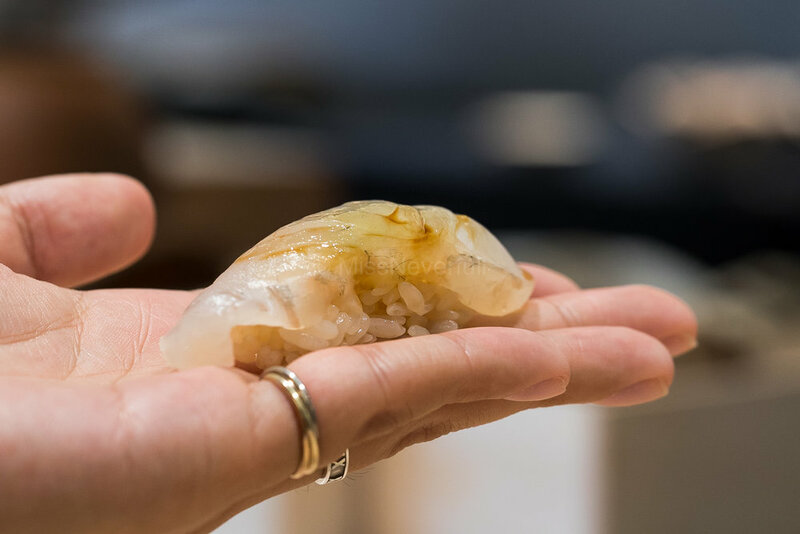 It appeared beautifully deep-fried, with a thin and crispy battering encasing a semi-sashimi textured flesh on the inside; a contrast of exciting textures on my taste buds. The intense flavour of karasumi on the side, went well with the Tachiuo, but that is not a deal breaker. It was a seasonal fish that made a deeper impression on us. As it was winter during our visit, we got to savour the catch of the season, Ankimo (monk fish liver). I found the Ankimo here really unique as it was served as a spoonful of paste which carried a taste was deep and umami, very creamy texture that melted on my tongue. Still recovering from the awe of gastronomic surprises, the last two dishes were served before we move on to nigiri sushi. Grilled to perfection, a plate of Saba was placed before us. Every bite into the cracker-textured skin revealed the succulent meat of the fish. The following dish was as impressive. It was Kinmedai on a bed of Uni Gohan (sea urchin rice). The tenderness of the fish, accompanied with the layer of rice infused with the flavour of sea urchin, was simply irresistible. After having seven fabulous ostumami dishes, it was time for the nigiri. 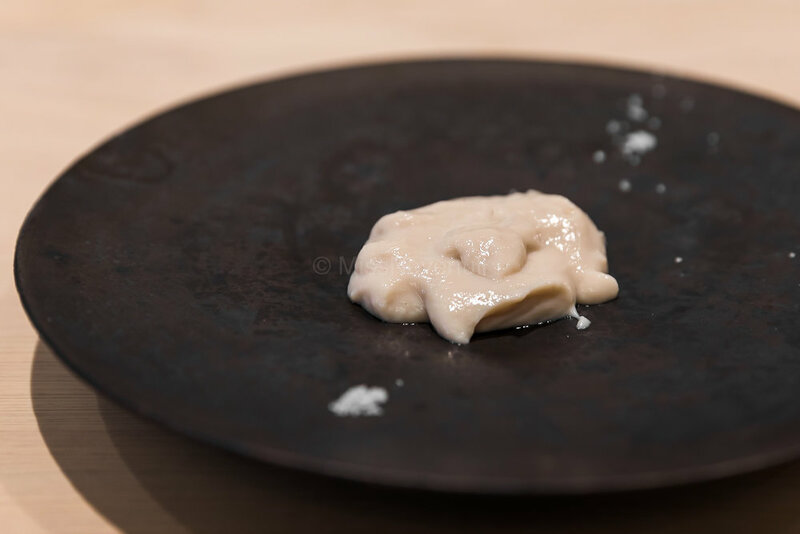 We began with those which were lighter on the palate, such as Hirame with kombu-jime, a creamy, clean piece of sumi-ika, and Kan-buri which was only available in this season. The Kan-buri had a stronger taste which made it one of my personal favourites on this menu. We then moved on the toro. Both the Akami and Aburi Otoro were pretty nice but I do not consider them outstanding. Among the three pieces of toro, my favorite was the Chutoro. It was served with sea salt which nicely enhanced the tastes. The skilfully sliced Kohada was also pretty good, with a right tinge of sourness. With regards to the shari dish, both the texture and flavour were exactly right on point. I was never a big fan of maki sushi (sushi rolls) as I consider them as a waste of my precious calorie intake. But Mitani's maki absolutely changed my perception. What made me gave in was a glimpse of the chef topping the maki with Uni. How often do you come across a maki topped with Uni? I couldn’t ask for more. I grew increasingly excited as I popped the maki into my mouth, anticipating the upcoming kanpyo maki (served later). The kanpyo was really crunchy and delicious. One of the maki was sandwiched inside the deep-fried tofu skin, which adds a distinct sweetness to it. I loved it. The next piece, Anago (tsume), was the winner on the lunch table. 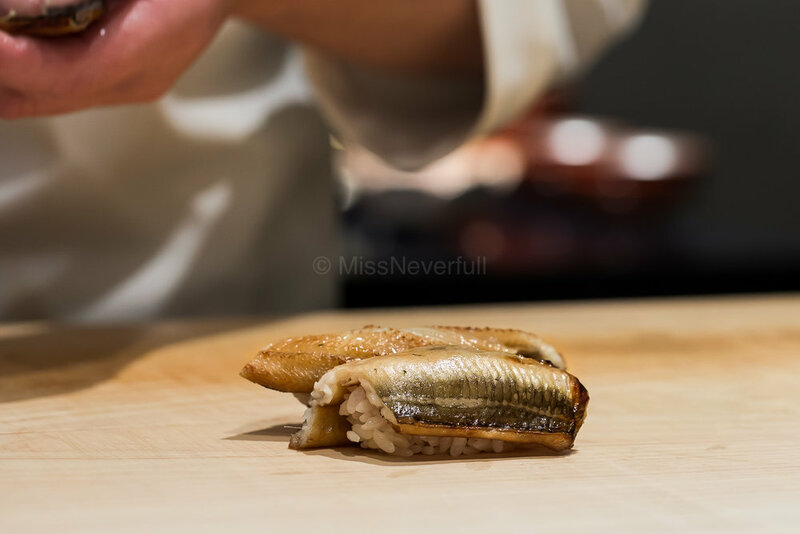 It was hands down the best Anago I have ever tasted (to me, it is much better than Kiyota's quite strong-taste Anago). Its delicate, creamy texture elevates its sweet and umami taste, perfect to marriage with the warm shiroshari. All three of us requested another two pieces of Anago although our stomachs were bursting at the seams. Last but not the least, a sweet ending was made by the Tamago-yaki (grilled sweet omelette). Crafted with eggs from Aqua farm Chichibu in Saitama, each came wit a price tag of JPY 500. These premium eggs were transformed into the best Tamago-yaki I have had to date. 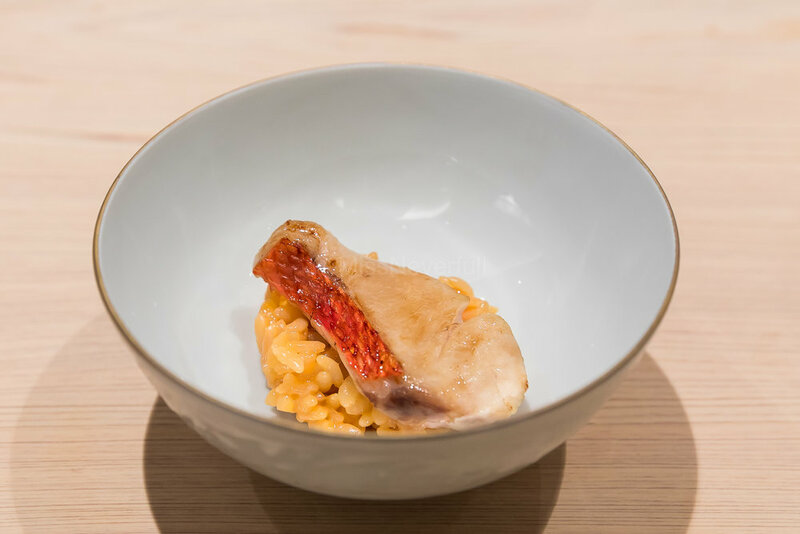 What made it so tantalising was its recipe – egg, dashi, shoyu and sugar. Basic dashi, not the usual prawn dashi typically used in the making of tamago-yaki, did the trick. 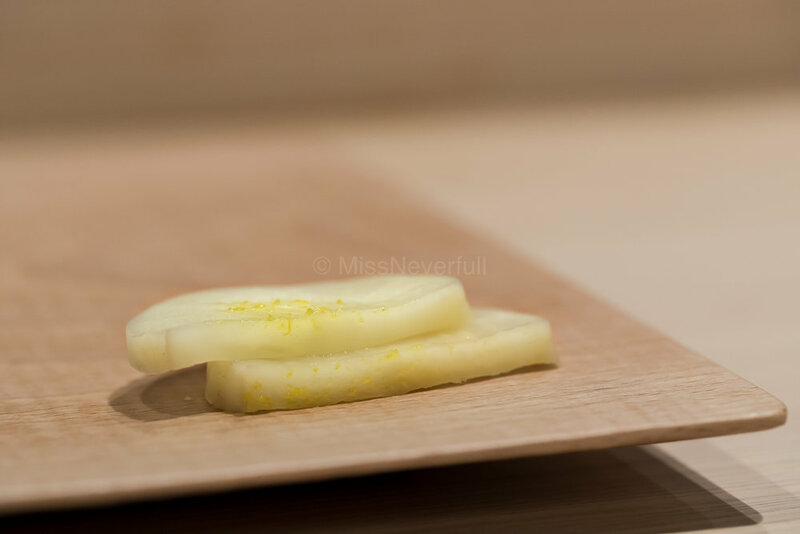 It yielded thick layers of mouth-watering tamago-yaki, so good that all of us asked two more pieces again. A meal at Mitani costs slightly less than 45,000 JPY with wine pairing. It may seem to be a little pricier compared to other sushiyas, but trust me, after tasting its menu, it is worth every penny. I will probably give Kioicho Mitani an 85 out of 100 - 80 for its nigiri and 95 for the ostumami and wine pairing. The ostumami here is evidently top notch, considering that it comes with wine pairing. Even for those who prefer to go without the wines, like my friend who joined me, will find every bit of the Omakase menu enjoyable. On the other hand, the nigiri lacked the WOW factor compared to the ostumami, but was still fairly good enough for me to return again. Although the nigiri here weren't taste that sharp as Jiro-style sushiyas, but it stands out in its own way. Right after the meal, we booked our next visit – which pretty much proved how much we liked Mitani’s sushi.